Where You Can Find Magnesium Casting In Denver | Protocast Inc. The prototype industry is unique in that it is constantly evolving, much more so than your average field of business. For metal shops like ours to stay viable and ahead of the curve, we must always be pushing ourselves to further our education and industry knowledge. In order to stay at the top of the market, it takes a unique company that, from the top down, is dedicated to continuously challenging themselves by learning new processes. Making something for the first time, while doing it with quality and according to a customer’s timeframe, is no easy thing. But we at Protocast Inc. work hard to master our craft, providing you with the tangible benefit of speeding up your operations with excellent turnaround times. We sacrifice nothing in terms of quality, but will typically be able to beat just about any schedule our competitors present. When you are restricted in terms of when you need a project or part to be completed, we are part of the efficient solution. Today’s post is about magnesium casting, as the title suggests. But if there is one thing you take away after reading this article, we hope that it’s that our Denver machine shop is more than capable of being your reliable partner in the field of metal casting. We’d love to be your partner in development; we work through your project in a step by step manner, sharing ideas in material choices, product designs, and machining techniques to achieve the best outcome possible. Put our experience and expertise to good use! We love having an open dialogue with our customers, many of whom end up becoming long-term clients. Our last post was all about aluminum casting, and today’s is dedicated to casting with magnesium. And while at Protocast Inc. specialize in casting and machining with aluminum alloys, we also have a wealth of experience when it comes to magnesium casting, with many projects involving structural applications. Back in the day, the World War II day(s), to be more precise, magnesium casting technology was originally developed for aerospace, defense, and automotive industries. The processes included gravity sand casting and permanent mold casting alongside high-pressure die casting. But why use magnesium as a casting alloy in the first place? Excellent question! We are glad you asked. Over the past few decades, magnesium casting has been used for thin-wall die casting applications due to its superior castability when compared to other metal alloys. Put simply, magnesium does certain things very well. Those certain things include its remarkable fluidity, its resistance to hydrogen porosity — characteristics which make it a superior choice over aluminum and copper for certain applications. 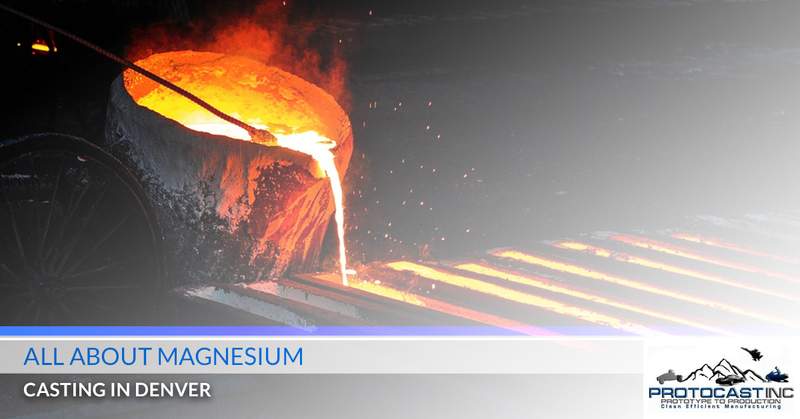 These days, magnesium is used for a wide variety of purposes in an equally wide variety of applications. It’s easy to understand why, too, when you consider the usefulness of an energy-efficient, environmentally-friendly, and lightweight structural solution. It also helps that there is plenty of magnesium in the first place — it’s our planet’s eighth most common element found in the crust! We are thorough, we are precise, and we are the top machine shop and foundry in Denver, CO. We’d love the opportunity to hear from you and learn about your company and intended project. There’s a strong chance we’ll be able to provide you with an affordable solution, whether it involves magnesium casting, aluminum casting, or otherwise! Contact us today.